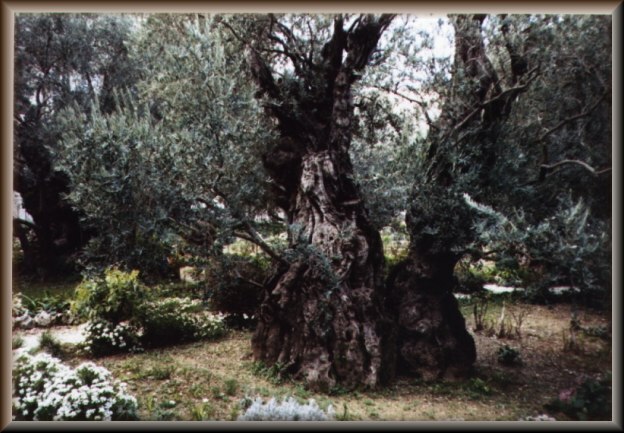 Welcome to a look at special olive tree located in the garden of Gethsemane, on the Mount of Olives (heb. 'Har Hazeitim'). 'Olivet' a sabbath day's journey from Jerusalem (Acts 1:12) lies close to the city on the east (Ezekiel 11:23) separated by the Kidron Valley. It's summit is about 300 feet higher than Jerusalem. (2,930 ft. above the Mediterranean). From here, you can view the Judean Hills to the Dead Sea and the blue lines of the Mountains of Moab beyond. 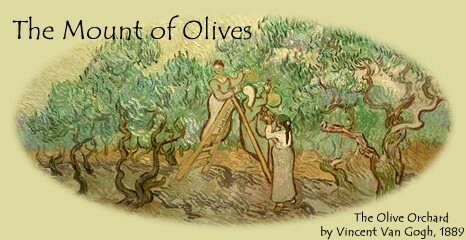 'In the garden of Gethsemane, there are eight olive trees whose age is lost in antiquity. Some botanists claim that they may be 3,000 years old. Josephus relates that Titus cut down all the trees in the besiege of Jerusalem in 70 A.C. If these escaped destruction, they are the very contemporaries of Christ as they are Roman olive trees. If not, they are without a doubt the shoots of those under which Yeshua prayed that night of his agony. "The olive trees does not die" (Pliny). They still bear fruit. The Garden of Gethsemane ('Oil Press') lies at the foot of the Mount of Olives. On the opposite hill, city followed city, but this garden is still kept as it was in the time of Jesus, maybe with the same olive trees. St. John spoke of it as a garden over the Kidron brook (John 18:1). This was a favored spot by Yeshua where He often went for retreat and prayer. (Luke 22:39, 40; Mark 14:32). This is the garden where Jesus on His last night underwent the most sorrowful hour of His passion (Luke 22:39-44). A north-to-south ridge of hills east of Jerusalem where Jesus was betrayed on the night before His crucifixion. This prominent feature of Jerusalem's landscape is a gently rounded hill, rising to about the height of 830 meters (2,676 feet) and overlooking the TEMPLE. The closeness of the Mount of Olives to Jerusalem's walls made this series of hills a grave strategic danger. 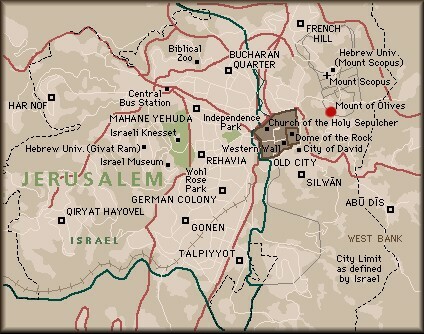 The Roman commander Titus had his headquarters on the northern extension of the ridge during the siege of Jerusalem in A. D. 70. He named the place Mount Scopus, or "Lookout Hill," because of the view which it offered over the city walls. The whole hill must have provided a platform for the Roman catapults that hurled heavy objects over the Jewish fortifications of the City. In ancient times the whole mount must have been heavily wooded. As its name implies, it was covered with dense olive groves. It was from this woodland that the people, under Nehemiah's command, gathered their branches of olive, oil trees, myrtle, and palm to make booths when the Feast of Tabernacles was restored after their years of captivity in Babylon. The trees also grew on this mountain or hill in New Testament times. When Jesus entered the city, the people who acclaimed him king must have gathered the branches with which they greeted His entry from this same wooded area. Another summit of the Mount of Olives is the one on which the "men of Galilee" stood as they watched the resurrected Christ ascend into heaven. Then there is the point to the south above the village of Silwan (or Siloam) on the slope above the spring. Which also said, Ye men of Galilee, why stand ye gazing up into heaven? this same Jesus, which is taken up from you into heaven, shall so come in like manner as ye have seen him go into heaven. Then returned they unto Jerusalem from the mount called Olivet, which is from Jerusalem a sabbath day's journey. Defined by a sharp cleft, it faces west along the converging Valley of HINNOM. It is called the Mount of Offense, or the "Mount of Corruption", because here King Solomon built "high places" for pagan deities that were worshiped by the people during his time [1 Kin. 11:5-7]. Although the Mount of Olives is close to Jerusalem, there are surprisingly few references to this range of hills in the Old Testament. As David fled from Jerusalem during the rebellion by his son Absalom, he apparently crossed the shoulder of the hill: "So David went up by the ascent of the Mount of Olives". Support may be found in this account for the claim that the road from the Jordan Valley did not go around the ridge in Bible times but crossed over the ridge, allowing the city of Jerusalem to break spectacularly on the traveler's sight as he topped the hill. The Mount of Olives is also mentioned in a reference by the prophet Zechariah to the future Day of the Lord: "In that day His feet will stand on the Mount of Olives, which faces Jerusalem on the east. And the Mount of Olives shall be split in two from east to west, making a very large valley; half of the mountain shall move toward the north and half of it toward the south". Christian tradition holds that when Christ returns to earth, His feet will touch first upon the Mount of Olives, the exact point from which He ascended into heaven. In the New Testament the Mount of Olives played a prominent part in the last week of our Lord's ministry. Jesus approached Jerusalem from the east, by way of Bethphage and Bethany, at the Mount of Olives (Matt. 21:1; Mark 11:1). As He drew near the descent of the Mount of Olives (Luke 19:37), the crowd spread their garments on the road, and others cut branches from the trees and spread them before Him. They began to praise God and shout, "Hosanna to the Son of David!" Jesus then went into Jerusalem and cleansed the Temple of the moneychangers; He delivered parables to the crowd and silenced the scribes and Pharisees with His wisdom. Later, as He sat on the Mount of Olives, the disciples came to Him privately, and He delivered what is known as "the Olivet Discourse," a long sermon that speaks of the signs of the times and the end of the age, the Great Tribulation, and the coming of the Son of Man. After Jesus had instituted the Lord's Supper on the night of His betrayal, He and His disciples sang a hymn and went out to the Mount of Olives, to the Garden of Gethsemane. In this garden, on the slopes of the Mount of Olives, Jesus was betrayed by Judas and delivered into the hands of His enemies. And when they had sung an hymn, they went out into the mount of Olives. Then saith Jesus unto them, All ye shall be offended because of me this night: for it is written, I will smite the shepherd, and the sheep of the flock shall be scattered abroad. But after I am risen again, I will go before you into Galilee. [geth SIMM uh nee] (olive press)-- the garden where Jesus often went alone or with His disciples for prayer, rest, or fellowship, and the site where He was betrayed by Judas on the night before His crucifixion (Luke 21:37; John 18:1-2). Gethsemane was situated on the Mount of Olives just east of Jerusalem, across the Kidron Valley and opposite the Temple (Mark 13:3; John 18:1). From its name scholars conclude that the garden was situated in an olive grove that contained an olive press. Attempts to locate the exact site of the garden have been unsuccessful. Many Christians have agreed on one site-- the place which Constantine's mother Helena designated about A. D. 325. But at least two other sites are also defended by tradition and have their supporters. The gospel accounts do not provide enough details to show the exact site of the garden.